Club Penguin Cheats by Mimo777 Club Penguin Cheats by Mimo777: Who is "Nickname" on Club Penguin? 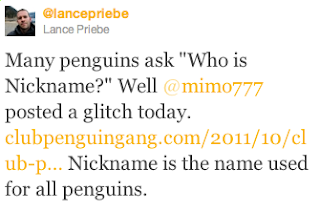 Our buddy Lance Priebe one of the founders of Club Penguin, tweeted the answer to this question. Oh yeah, and he mentioned @MIMO777 and this site, clubpenguingang.com! So now you know! "Nickname" is the name used for all penguins! Why did he randomly say you posted a glitch? What made you pick the name "Mimo777"
You know what we should all do? Since we all play Club Penguin, we should write a comment here or on the next topic with the name Nickname. It will be fun. Why would you put your penguin's name as "Nickname" when the penguin's name is supposed to be a name, not a nickmae? Hahaha I'm just being stupid don't be confused why I'm even writing this!